For Cat Bloggers, the world over, the Carnival was once an important way to discover blogs they might never have heard of, on subjects of all kinds! It was an opportunity for them to reach an audience they might not otherwise reach. It was a chance to promote a post or 2, each week, that they thought would be of interest to others, and to pitch them using more than 140 characters or just a short sentence barely long enough to get a point across. On Sept. 13th, or a few days after, this blog will host the 600th weekly edition of the Carnival, uninterrupted, since Spring 2004. That's 3 weeks away from now. For now, let's get to THIS edition! 1. 1st over at Mind of Mog...and a Facebook update to her recent blog update. "Having episodes of SVT and will have ablation done...Nice to know what it is. Had problems with it before so not a surprise. I am on a waiting list for October. SVT is supraventricular tachycardia, a rapid heart rate originating in the atria, typically atrial tachycardia, atrial fibrillation and atrial flutter, any of which can be ineffective in pumping blood....Ablation is where the doctor cauterizes or freezes the spot causing the abnormal rhythm. It is done outpatient now so is a fairly simple procedure." 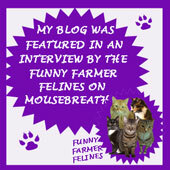 Please stop by her blog with your purrs and purrayers for Miss Mog. "Luna continues to improve after her surgery. She has had her stitches removed and she was clear to be cone-free....In the midst of Luna’s health crisis, I suddenly find myself facing one as well. Two Wednesdays ago, I suddenly started having distorted vision in my left eye and localized headaches in the vicinity of the same eye. I quickly went for an eye exam, and it deemed serious enough to warrant a visit to a retina specialist as soon as possible." She suggests googling “central vein occlusion” and “retinal hemorrhaging” to learn about her issues and has a bit more to say about Luna and herself in this blog post, with a cool photo of them both. 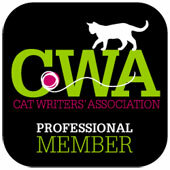 Please stop by their blog with your purrs and purrayers. 3. As for us, nothing new but in case you missed it the first time we shared it...Sneakers and I on video! 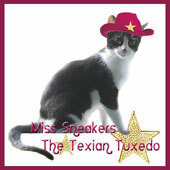 I Am Sneakers the Texian Tuxedo...Hear Me Meow!! 4. Over at StrangeRanger...Memories of Miss Ivy, in words and photos. 5. 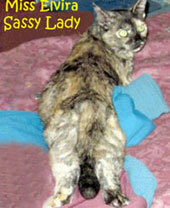 Over at Life from a Cat's Perspective...Nice tail, girlfriend! Hee, hee! 6. Over at Sparkle Cat... The 3 cats get a very different treat... raw chicken hearts! The photos and descriptions of the 3 very different reactions are hilarious! 7. Over at Marian Allen's blog...Amidala reports on a new kitten and some, um, weighty issues for Sweetie Pie & Munchkin. 8. Over at Brian's Home...Precious Has a Ball. 9 and 10. Over at Animal Shelter Volunteer Life...Given the choice which would you, dear human reader, adopt...a Creamisicle or Paris? Can't decide? Well, there's Rudy, too! 11. Over at Traveling Cats...a cat in Spain. 12. 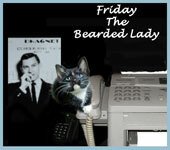 Over at 15 and Meowing...Lucy Thursday photos. 13. Over at Marks Mews...Get a load of Ayla and her toes! Hee, hee! 14. 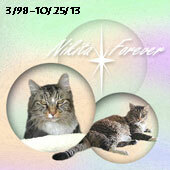 Over at I Have 3 Cats...Noah's relationship with Cammie is changing! 1. Friday Ark #533 (actually #534, hee, hee!) - Cats, Dogs, Birds, Invertebrates, Other Vertebrates and the Extinct! Oh, my! 2. Camera Critters #385 - The oldest active meme about photos of animals/critters! 4. Create With Joy and her cats host a Wordless Wednesday with always interesting essay topics and photos of the resident cats - " Share your cat photos and stories with us each week (Submissions accepted all week!)" Thank you for hosting, dear pals! Thanks for all the updates - I am purring for so many of my pals! Thank you so much for all the purrs and thoughts for both of us!